Imagine answering the telephone and the person on the other end says, “We have an old guitar we would like to sell.” When asked to describe the guitar, they answer, “It’s a Gibson electric bought new around the late ‘50s. It’s yellow in color with a red outside edge, and it’s a Les Paul model.” After a road trip through the countryside, we were soon in front of a well-known vintage brown case about to be opened. Inside was an all-original, one-owner 1959 Gibson Les Paul Standard (#9 1942) with a flame-maple top and sunburst finish. This guitar was originally purchased for $260, including the hardshell case, from a music store in Iowa on July 1st, 1960. All of the original purchase agreements, strap and adjustment instructions were also included. The Lifton-style five-latch case had a “Stone case company in Brooklyn, NY” badge on the inside neck pocket. The Gibson nameplate was not on the outside of the case near the handle. This guitar weighs nine pounds, with a slightly slim C-neck profile, while the PAF humbucking pickups have double black bobbins. The neck pickup measures 8.6 Ω while the bridge pickup measures 8 Ω. Many of the late 1950s cherry sunburst Les Paul finishes faded over time, and this one is no exception, fading to an iced tea color with a dark hue located near the toggle switch. Gibson offered the Les Paul model in sunburst finish from 1958 thru 1960, switching to the SG body style in 1961. 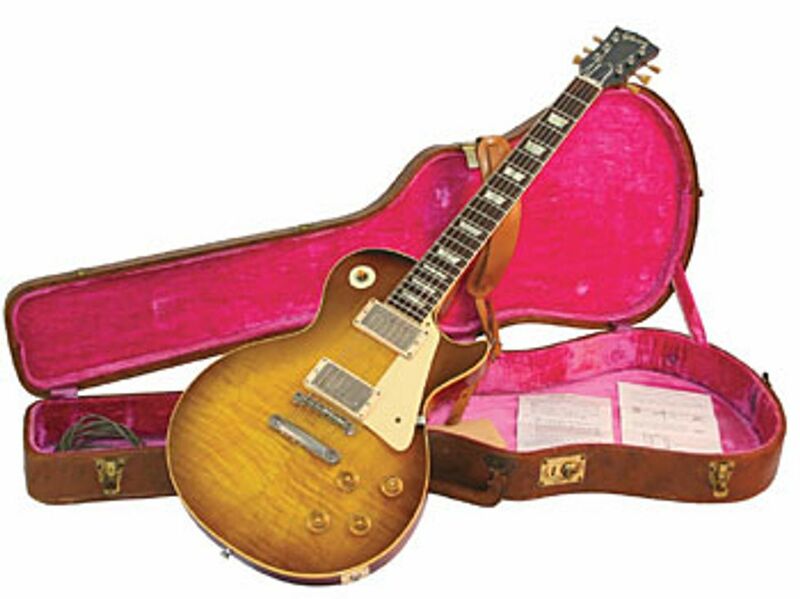 Today, the 1959 Gibson Les Paul is considered to be one of the most highly collectable guitars in the vintage market. The Les Paul can be heard on some of the most historically significant and popular recordings, and many highly informative books and online forums have studied this instrument down to the smallest detail. As often as we walk through our vintage collection room, it’s almost impossible not to glance at the 1959 Les Paul and remember how excited we were on the return trip back to the guitar shop. We still feel very thankful to have experienced this rare purchase opportunity and are proud to display this iconic instrument in our vintage showroom.